Stampin' Up! launched a new product line today. 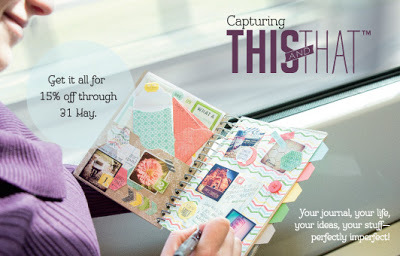 For all of us that love scrapbooking but never seem to get time to do it - this is the perfect way to document the lives of ourselves and those we love, our special occasions and events, our highs and lows. Anything really! Those of you that know me, or follow my blog, will have seen my smash book pages (see eg here) where I keep memento's and bits and pieces from my life and travels. I love this sort of scrapbooking style as you don't have to be neat and tidy, or particularly creative, as anything goes. Well, the Stampin' Up! 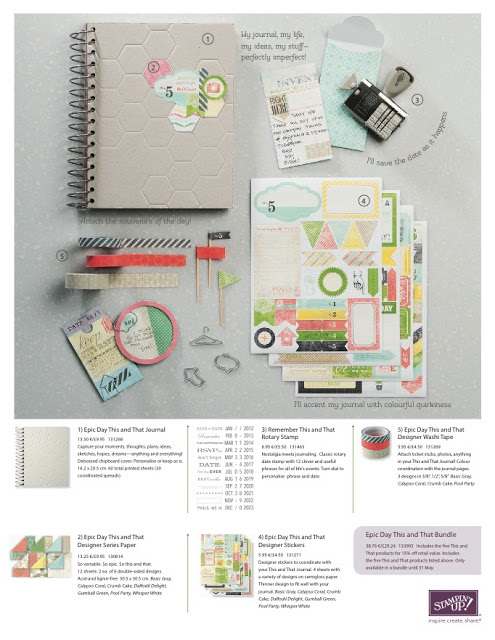 This and That product range which will be available from 1 July, in the new catalogue, is similar and I personally can't wait to get my hands on these products. During this month you have the chance to take a sneak peak at what is to come and the best news is that it's with 15% off the RRP.